This desk is a great addition to your home! 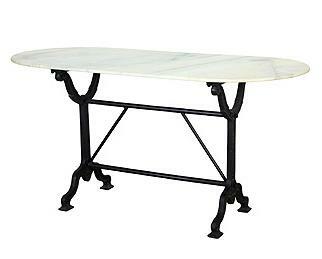 It features an oval cream-colored marble top and a black trestle base. Use this desk to organize your every day life in style. The Rockwell Oval Writing Desk with Marble Top by Four Hands at Reeds Furniture in the Los Angeles, Thousand Oaks, Simi Valley, Agoura Hills, Woodland Hills, California area. Product availability may vary. Contact us for the most current availability on this product. Finish & Paint Options Dark, natural, and white wood finishes with iron dark finishes. Case Construction Hand-crafted of mango wood and iron. Mango wood is a fast-growing environmentally friendly hardwood. The wood is harvested after the trees no longer bear fruit. Mango is durable and highly resistant to moisture. A perfect mix of art and function, the Rockwell collection utilizes refurbished materials like cast iron, steel, and cogs and footings from old buildings to create intriguing furniture with an industrial influence. Tripod pedestals give pieces dramatic silhouettes, while trestle bases evoke images of machinery or locomotive engineering, complete with scroll and letter detailing. Select table tops are crafted from Mango wood, giving these items a warm, natural feel that adds a gentle touch to the cold, evocative refurbished steels and irons. Create a dining area that blends everyday function with artistic and Eco-friendly refurbishments when you complete your home with the Rockwell collection. The Rockwell collection is a great option if you are looking for Traditional furniture in the Los Angeles, Thousand Oaks, Simi Valley, Agoura Hills, Woodland Hills, California area. Browse other items in the Rockwell collection from Reeds Furniture in the Los Angeles, Thousand Oaks, Simi Valley, Agoura Hills, Woodland Hills, California area.